I remember standing on the stage, looking out into the sea of blue corduroy jackets. My sister lied. She told me that I wouldn’t be able to see anyone because the lights were so bright. But no; I could see EVERYONE! Let me explain the background of my situation. The year previous of this event, my sister was elected as the 2009-2010 Idaho State FFA Treasurer. Like all state officers, she had prepared a retiring address to give at the State Leadership Conference in April. She asked that my other older sister, one of my older brothers, as well as myself introduce her for this speech. My nine-year-old self was terrified. But I put my brave face on, walked on that stage as only a determined nine-year-old could do, jumped up on my designated step stool, and I read my part of the introduction in front of the entire Idaho State FFA Convention. All the while I proudly sported my “FFA: Future Member in Training” t-shirt. From this experience I learned a couple things. One: from that moment I knew I wanted to be a member of the FFA. Being on the stage was just as exhilarating as it was frightening, and I loved how enthusiastic the atmosphere was at the convention. And two: when we step outside of our comfort zones, we can experience life to the fullest. Too often, we find ourselves “playing it safe,” unwilling to try new things for the fear of failure. But outside our comfort zone is where we grow into better leaders and great people. Outside of the comfort zone is where we make lifelong friends and gain experiences that are worth telling about in the future. For some, getting out of the comfort zone may be reciting the FFA Creed in front of their peers. Maybe it’s running for a District Officer position or being the first one to talk to that new student that just moved in. Whatever the case may be, it is necessary to go beyond our comfort zone. At the time it may seem to be impossible and scary; but looking back, those are always the times we have the greatest memories of. All it takes is one small step out of our comfort zone to make a big impact in our lives. In my case, I didn’t realize just how much that experience as a nine-year-old meant to me until much later down the road. In my mind, this event doesn’t seem as though it happened all that too long ago. However, now I’m on the last leg of my FFA career as a senior in high school. Although it makes me extremely sad to be almost done with my FFA career, I am grateful for everything I’ve learned during my years as a member. FFA has pushed me to become a more outgoing individual, I’ve gained career experience from the many CDE’s and SAE’s I’ve been a part of, I’ve had countless leadership opportunities, and I have some of my best memories from FFA activities. None of this would have been possible had I not gone outside my comfort zone. Don’t let your comfort zone restrict you from reaching your true potential. Comfort zones are only there to show us how we can better ourselves. Take a step out of your comfort zone and live your best life! Shalani, thank you for helping us learn about stepping out of our comfort zones! 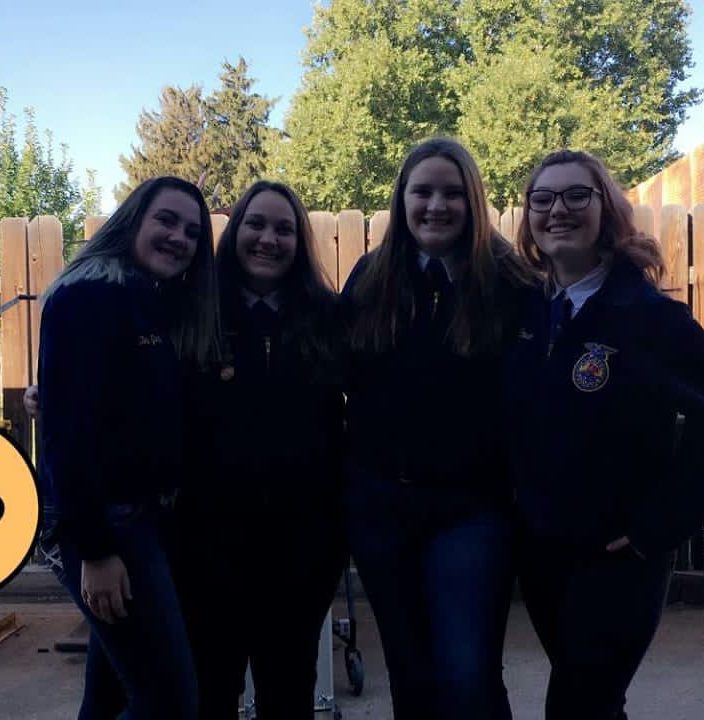 We are glad that we have a brave and bold person like you to be a part of the Idaho FFA Association. Nelson Mandela once said, “A leader is like a shepherd. He stays behind the flock, letting the most nimble go out ahead, where upon the others follow, not realizing that all along they were being directed from behind.” I am a confident believer that the best way to be a leader, is to be a servant leader. This type of leadership puts the growth and experience of followers and members first. Servant leadership is saying, “Where am I needed?” and not minding if you are recognized for it. Helping others develop their tool box in order to achieve their goals has always brought a smile to my face. Nothing makes me happier than watching someone grow into the best version of themselves and I love to be a part of their journey, encouraging and helping them. In high school, I had the opportunity to be a part of many different clubs and organizations. I was primarily a member of my FFA chapter and my school’s National Honor Society chapter. Both of these clubs have an emphasis in serving others and giving back. One of my favorite memories from high school is when I was asked to work with a local elementary school’s Junior Honor Society. I spent time with 4th, 5th, and 6th graders, helping them develop their leadership skills and passion for serving others. I remember during my time spent with these kids that I felt defeated, because it didn’t seem like they were retaining my message very well. I worried that I wasn’t explaining the content well enough or that my teaching methods were not very effective. When I left on the first day, I had accepted that when I would return in a few months that they would not have done any of the community service projects we had planned together, and it would be my fault. When I came back, I braced myself to be disappointed- not in the students, but in myself. We sat in a circle and with slim hopes, I asked if anyone had anything they would like to share about their projects. Every single group stood up and shared how they had been impacted by the projects they had done over the holiday season. These kids had organized canned food drives, collected pet shelter supplies, given clothes and toiletries to homeless shelters, helped at soup kitchens, visited assisted/senior living centers, and created care packages for kids in hospitals. One student, with tears streaming down his face, shared that his grandfather had recently passed away from cancer so for his project, he visited cancer patients in the hospital. He said that it was one of the best things he had ever done. When I left that day, I sat in my car for almost an hour reflecting on the stories the kids had shared. I cried- my heart was overjoyed because I realized that 1) I had made a difference in these kids’ lives and 2) they went on to make a difference in the lives of others and 3) even though it was my job to teach them about servant leadership, they had taught me about the widespread impact that our service can have. This experience solidified my desire to be an educator and my faith in the strength of true leadership. Leadership is not about taking credit for being the boss or directing the event. Leadership is about building other leaders. A selfish leader may accomplish the task at hand, but they may have missed an opportunity to help others develop their skills. When I think about servant leadership, the phrase, “people over policy” comes to mind. While leadership may not always be in a political setting, it’s important for us to remember that when we are guiding others, we are dealing with real people. These people have their own stories, talents, and insecurities. If we are conscious of the people around us, we will be better able to help them grow and succeed. Each year our chapter has a community Christmas project. We involve the entire 7-12 grades at our school not just FFA members. We come up with a grocery list that would involve having a nice Christmas breakfast and dinner. We give each class the list and give them a deadline to complete the list. There is a reward for the class that completes it first. We also ask each FFA member to donate at least $3. Our teacher, Mrs. Schumann talks to the teachers in both the elementary and high schools and local church and community leaders. She gathers information about who in our community might be in need. She does not share the information with us because our town is so small we don't want anyone to feel self-conscience especially if they go to school. Mrs. Schumann chooses 8 families to help with food. With the money raised by FFA members she chooses one family to help with gifts and food. She tells the members the gender and age of the family members and some of our members are lucky enough to go shopping for those gifts. We all help wrap the gifts and sort the food to get it ready for delivery. Mrs. Schumann delivers the food and gifts by herself and tells people someone wanted them to have it, so in some cases they don't even know that it is from the FFA. Some of the food she delivers to local church leaders and they deliver it and even Mrs. Schumann doesn't know who it goes to. We've been doing this project for about 10 years. Over the years we have even had some of the elementary grades want to join in and help with food donation. Each year our community members and church leaders are extremely appreciative of this project and how it benefits people. Justin, thank you for sharing your chapter’s story on how you all live to serve! The Idaho FFA Association admires your passion to serve others and make a difference in their lives. Keep up the great work, Raft River!